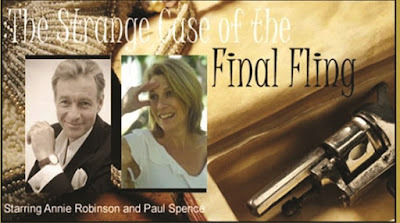 Paul Spence and Annie Robinson are delighted to return to the Hexagon Dive in Pietermaritzburg with the seventh in their hugely popular series of classy murder mysteries, The Strange Case of the Final Fling. Written and directed by Paul, the production is a modern story, set in the KZN of today. The setting is a weekend party at a luxurious mansion on the Hilton Ridge, thrown by mysterious KZN tycoon, Brent Crewe-Doyle. After a shocking murder at the mansion, our heroine, Kate Economides (a surprise guest at the party) realises that she is the prime suspect. The audience are invited to join Kate, the unlikely detective, in a desperate race against time as she tries to unravel the dark secrets that underlie The Strange Case of the Final Fling. After her high-profile divorce from a north coast property baron, a rather shaken Kate is invited by her celebrity shrink, Phil Banting, to a weekend party at a luxurious Hilton Ridge. The last thing Kate expects is for her care-free varsity past to emerge out of the mist to haunt her. The resulting theories, from table to table, are always hilarious – and the audience are royally entertained!